Soccer is not on my list of favourite games to watch. This article uses probability to help explain my position on soccer. It’s just my opinion and it’s not my intention to upset soccer lovers. If you enjoy soccer then soccer is a good thing. Going for goals does not guarantee a goal is scored. Similarly defending goals does not guarantee a goal is not scored. This is not unique to soccer. It applies to all sports. Going for goals yields a chance of scoring a goal. With better skills the chances of scoring a goal is also better but it is never guaranteed. The probabilistic nature of sport forms the basis of this article. For the sake of simplicity, this article will refer to all the factors that affect the chances of scoring a goal as skill. So skill encompasses natural skill, training, desire to win, teamwork, leadership, effort, tactics, confidence, budget and anything else you can think of that affects the probability of scoring a goal. Skill in this article is the average of all those things. A binomial probability distribution defines the probability of success in a sequence of discrete independent yes / no experiments. A binomial distribution will be used to model the outcome of a game of sport. Success is winning the match. Failure is drawing or losing. Let’s say we have n total goals scored in a match. Success is defined as scoring more than half of the total number of goals in a match. If n is odd, then n/2 + 0.5 or more goals need to be scored for success. If n is even then n/2 + 1 or more goals need to be scored for success. 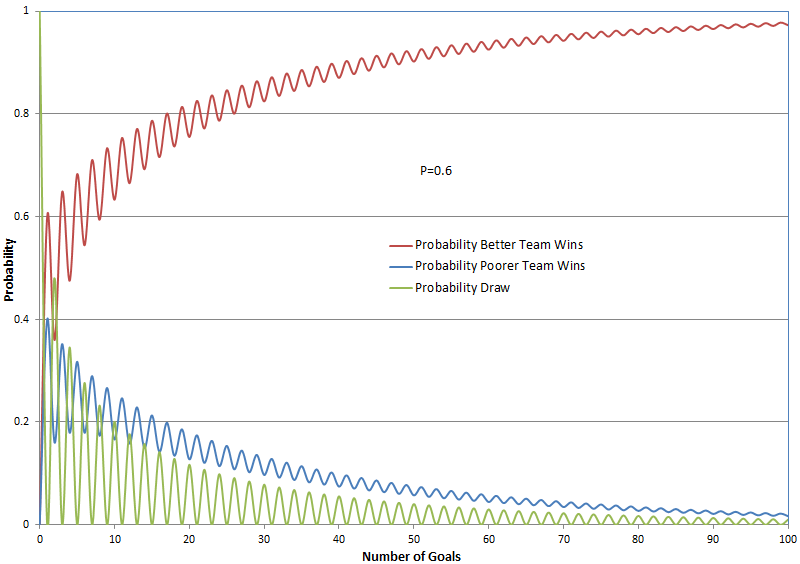 When n is odd, the chances of success is the cumulative probability of scoring from n/2 + 0.5 up to n goals. When n is even success is when scoring anything between n/2 + 1 to n goals. The probability of a team scoring an individual goal is how we will model the relative skill between the two playing teams. In real life the skill level varies throughout the match as teams have good or bad runs, gain confidence, change tactics etc, but for this we assume a fixed skill for the duration of the match. Imagine that we take an average of the skill level throughout the match and use the average for all our calculations. Assuming a goal is scored, lets define P as the probability of the better team scoring that goal. 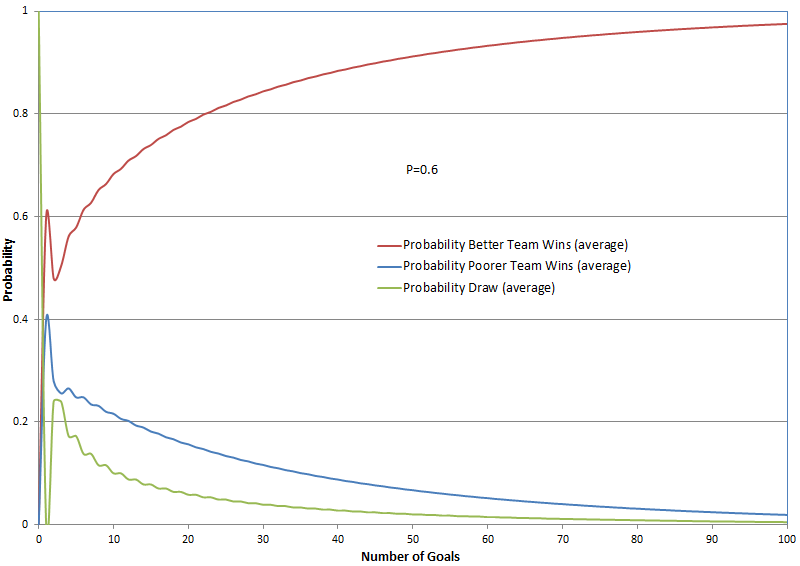 Then 1-P is the probability of the poorer team scoring that goal. 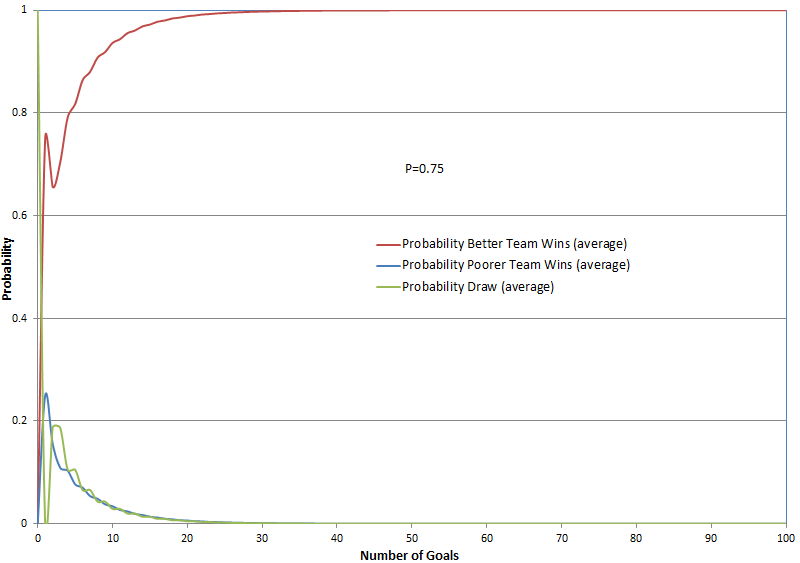 Below is a chart that shows how the probabilities shape up against number of goals scored when P=0.6. The probability of a draw is zero for an odd number of goals and non-zero for an even number of goals. This is the cause of the oscillations. I’m not really interested in how the probability of a draw oscillates between odd and even goals so in the next chart I’ve used a moving average to filter out the ripples and more clearly illustrate the general shape of the probability distributions. For the rest of the article only the average chart will be displayed. With zero goals scored the probability of either team winning is zero and the probability of a draw is 100%. With 1 goal scored, the probability of the better team winning is 60% and the probability of the poorer team winning is 40%. With more goals it becomes more likely for the better team to win and less likely for the poorer team to win. A draw also becomes less likely with more goals. As the number of goals become very large the better team will always win and the poorer team will always lose. The case where P=0.6 might describe a reasonably close game. What about when one team dominates? Examples of larger P are shown below. With P=0.75 there is still no chance of either team winning if no goals are scored. This is true for any value of P. When one goal is scored the better team has a 75% chance of winning and the poorer team has a 25% chance of winning. It is clear from the charts that as P becomes larger fewer goals are required to yield an almost certain probability that the better team wins. The number of goals is the average number of total goals expected to be scored in a match. It is the sum of the number of goals scored by each team. Very few goals are scored in soccer so soccer sits on the far left hand side of the above graphs. Other sports sit somewhere further to the right. Few goals are scored in soccer. This means the odds of the better team winning aren’t as good as they should be. For a one sided game, with a very good team playing against a very bad team, P might be say above 0.9 and several goals will likely be scored as the better team dominates. So in this case, even for soccer, the better team will likely always win. But I want to focus on when two good teams play and one is a bit better than the other. 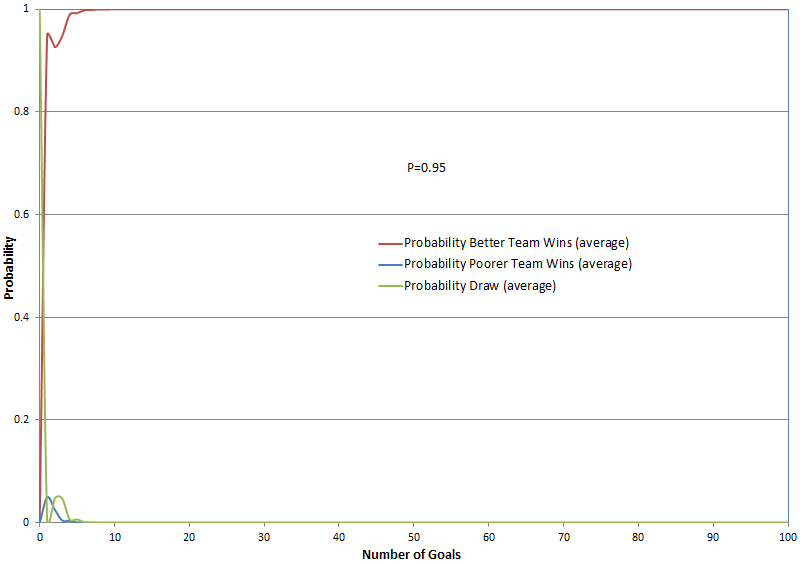 For example, when P=0.6 and the total number of goals scored is 2, the better team only has a 36% chance of winning. The chance of a draw is 48% and the chance of the poorer team winning is 16%. The better team still has better odds of winning compared to the poorer team but the most likely result is a draw and the better team has poorer odds of winning than a 50/50 coin flip. When the number of goals scored is more typical of the score in other sports, let’s pick say 100 for basketball, then when P=0.6 the probability of the better team winning is about 97.3%, the chance of the poorer team winning is 1.7% and the chance of a draw is about 1%. Remember we are talking total number of goals – the sum of the score of both teams, so 100 is reasonable for basketball. Even a bit low. Below I discuss in more detail what the low expected number of goals means for soccer. The low scoring in soccer fosters a culture of theatrics, diving and poor sportsmanship. Players will use whatever tools available to them to win. In soccer the returns on taking a dive are good. A soccer player can score 100% of his team’s total score and win the game by taking a dive. This poor sportsmanship isn’t because soccer players are inherently this way. It is a product of low scores. A player will go for whatever he or she believes yields the best risk vs return to win the match. In other sports the returns for taking a dive are much less. Only a few % of the team’s total can be made through diving. Better returns can be garnered through exploiting offensive skill and consistently scoring goals. In my opinion the widespread poor sportsmanship makes soccer not so enjoyable to watch. Low scores mean many games end in a draw. Many games end without any score at all. Watching the skilled ball handling in a match may be entertaining but if there is no result you might as well just be watching a skills demonstration. There is no merit in calling it a match. In my opinion such infrequent scoring and so many draws makes soccer boring. With so few goals, in a close match the better team has poor odds of winning. The most likely result is a draw. The odds of winning are worse than the pure chance of guessing heads or tails in a coin flip. In other sports the better team will be able to score many goals as their edge manifests over a large set of data to yield a higher score. So the better team wins. In soccer, the very small sample set of goals means it is not a good system for determining the better team. Luck ends up determining the result of the game. I don’t mean soccer requires no skill. I mean, with so few goals, there is no opportunity for skill to manifest on the score board. So if skill isn’t determining the outcome of the game then luck is. Imagine you have a coin with a slight bias to land a certain side up. Flicking the coin once will not give you a very good chance of determining what that bias is. Tossing the coin many times will give you a better idea as to what that bias is. In soccer the data set is too small to accurately illustrate who the better team is. For example often a team can dominate every statistic in soccer – possession, shots on goal, etc, yet the score board indicates otherwise. In other sports dominating statistics will nearly always be reflected on the score board. In my opinion not allowing the better team to win is frustrating and against a key philosophy regarding sport – rewarding skill, effort, sportsmanship, etc. It sends the wrong message to young sports people. Allowing the better team to win does not result in a predictable match. It does not mean the team that is higher on the ladder always wins or the favourite always wins. Before the match it is not known who the better team will be on the day. Anyone could win. It’s like tossing a coin with a slight bias to landing one side but not knowing which side has the bias. Before any coin flips you have no idea what the bias is. You need to perform the experiment of flipping the coin many times to get an idea as to what side has the bias. In a typical low scoring soccer game, an umpire can award 100% of a team’s score in a single decision via a penalty. This is equivalent to an 80 point free throw / foul shot in basketball. Everyone will agree that awarding an 80 point foul shot in basketball is completely ridiculous. Imagine a basketball match where the better team has scored 100 points and the poorer team has scored only 30 points. The better team dominates in all statistics, is more skillful, better at offense, better at defense, plays fairly and is more honest. The poorer team has bad skills and bad sportsmanship. Then the umpire’s judgement awards an 80 point foul shot to the poorer team and the poorer team wins. What a ridiculous scenario. Yet this is ok in soccer. In my opinion allowing an umpire to completely decide the result of a game makes the game boring and frustrating. With so few goals scored, an issue such as whether someone’s foot was over the penalty line or not becomes very significant. In other sports it doesn’t usually matter. The technicalities average out to zero as the better team consistently scores more goals. In soccer the technicality can determine 100% of the team’s score and dictate who wins the match. Some may argue this is why soccer needs better umpiring so that decisions are accurate and fair. This is irrelevant. The point is it shouldn’t matter. Having accurate umpiring still means the match can be determined by a technicality, even if the umpire’s decision is correct. In other sports it doesn’t matter because the better team can consistently score goals. The technicality accounts for only a small percentage of the total score. In my opinion having a match determined by a technicality is boring and frustrating. It’s simple. More goals. All the problems I’ve presented go away with more goals. Soccer doesn’t need a video umpire. It doesn’t need harsher penalties for diving. Why have a system where players are forced to behave through harsh penalties rather then have them intrinsically motivated by better opportunities to score? I don’t know the best way of achieving more goals. Whatever is most entertaining I suppose. Wider goal posts is an obvious answer. You might like the fact that goals are so difficult to score in soccer. You might find the fact that the game can so easily slip one way or the other entertaining and exciting. That is ok. This article is just my opinion. I’m not here to argue about whether soccer is the most popular sport in the world or not. The purpose of this article is not to say soccer is crap. It is to express my point of view and explain how low scores effect the probabilistic nature of sport. More goals would make soccer better for me. However many people love soccer and have every right to do so. Unfortunately the ONE BIG life lesson is that emotion usually trumps logic. Unfortunate but true. Hence the ongoing Men are from Mars, Women are from Venus problem. How about an article on getting in touch with your emotional self? Yo Pete not stoned but it is true I watch very little TV. Why watch someone else’s crappy stories when I can make my own crappy stories? Yeah it’s interesting so see how others set their vehicles up. Point me to your blog. Being a statistician by trade and a football fan, I find this article very amusing because they already found a solution to this problem. Its called a season and it has all the nice mathematical properties you’re looking for but importantly it leaves the inherent unpredictability of single matches intact. I should also point out to you that a simple binomial model is probably not the best. Two better options would be a zero inflated Poisson for the total number of goals and whats known as a frailty model, which handles time to an event (goal) where there can be multiple events. Hey barkerov your season solution doesn’t seem to work very well. There’s so much diving in soccer that I’m embarrassed to watch. How does the season help the world cup being determined by whether the goal keeper guesses the right way to dive to save a penalty? My observations are based on the current form of the game. The observations came first, they’re still valid whether I try to explain them with statistics or not. The choice of distribution is irrelevant, the point is not enough goals yields all the negative observations that I mention in the article. I think it’s a pretty basic logical proof that, given there are already seasons in soccer, and that my observations are valid, that seasons aren’t the solution. Are you saying diving isn’t a problem in soccer? Because from what I can gather from popular media it is a problem. You don’t think more goals would help? Doesn’t this article explain why more goals would help? Then there are all the other silly things like no punching or even tripping each other and you cannot pick the ball up! Rugby union! Much more entertaining and satisfying. And no goalie needed and a very wide scoring area.